1. 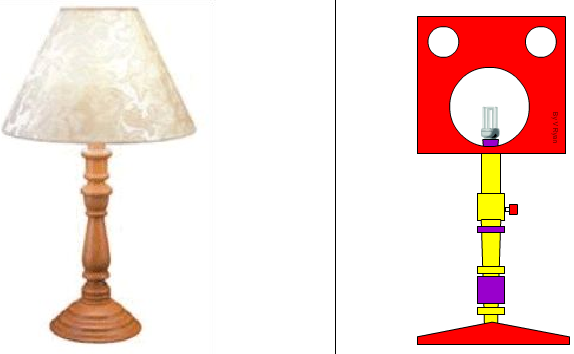 Two table lamps are shown below. How does the Memphis inspired lamp differ from the traditional lamp? The Memphis lamp is colourful and bright. It has been designed to look very different to traditional lamps. It combines materials such as ‘plastic’ and glass. It has not been manufactured from traditional materials such as wood. It is artistic, an interesting piece of artwork and could easily be part of a display. It is a ‘one off’, manufactured for a specific customer, unlike the traditional lamp which is mass produced and can be bought anywhere. 2. The Memphis inspired design has been manufactured from recycled and reclaimed materials and components. Why is the use of recycled and reclaimed materials important in the protection of our environment? The key phrases may help you answer this question. When we use recycled or reclaimed materials, we do not need new materials. This means fewer trees are cut down or less iron / aluminium (bauxite) ore is required. Using recycled materials saves our forests and reduces the energy needed to process new materials. In turn, this reduces pollution, protecting the environment. Recycling / reclaiming materials and using them again, results in less waste, as the materials are not thrown away. Manufacturing products from recycled and reclaimed materials is sustainable, because we will reduce pressure on the Earth’s ‘finite’ resources. 3. In the space opposite, sketch a lamp based on this traditional design and based on a Memphis style. A combination design.